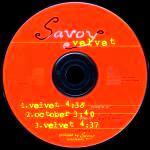 The CD single of "Velvet" was released in the UK several months after it was first released in Norway. The cover has an orangy yellow, slightly out of focus picture of a hand on guitar strings. The reverse of the insert has an orangy yellow picture of Pal's middle, holding a guitar. The tracks are printed in light blue across the other with additional text in blue and white. The German made CD is orange with the silver Savoy logo at the top plus the title in yellow underneath. The track list is in yellow and silver at the bottom of the disc. Velvet (single mix) 4:38, October (non-LP track) 3:40, Velvet (Greene Street Mix) 4:37 Band set-up: Paul Savoy (guitar/vocals), Lorraine Savoy (bass/vocals) and Roland David (drums). Both editions fail to mention D'Sound vocalist Simone Larsen as the backing singer. Velvet was released to radio stations in the U.S. The promo release comes in a jewel case without a front sleeve, but with a back insert. The insert is grey with a large WB logo in the background. The title is printed in black letters in the centre of the sleeve with "Promotion Only - Not For Sale" priinted in the top right corner. The disc is silver with black text. It features only two tracks: The edit version (3:45) and the album version (4:35) of Velvet.